Entry is open to the public, with an admission fee of $15 per person. Admission allows entry to both days - Saturday & Sunday. Children under twelve are admitted free. A porcelain tasting cup and shopping bag will be provided as part the admission fee (as long as supplies last). The tasting cup allows sampling of tea at the program sessions and at the exhibiting vendor booths. There is no additional cost for stage presentations, tea tasting sessions or entry to the exhibiting vendor area. Some workshops do have additional fees. The Tea Bar is free and can be found in the east side of the Exhibition Hall. It will be open throughout the afternoon and will be serving dozens of different kinds of tea in a variety of quick and fun themes. Similar teas will be compared. Unusual teas will be explored. Rare teas will be savored. The tea bar is an opportunity for a couple of quick cups of tea with a educational bonus! Be sure to visit it, we are sure you will be glad you did.. Complete 2018 program descriptions will be coming soon in early August. Advance sales for workshops and general admission will be available on this site at the beginning of September. Additional tickets for these workshops and tea tasting will be available during the festival. They are on a first come first serve basis so arrive early. China is the original home of tea-making, while Japan and Taiwan have developed their own rich tea heritage in modern history. New tea producing regions such as India, Sri Lanka, Malawi, and Nepal have satisfied the low-priced, commodity tea demand of the world, but certain economic and environmental conditions have encouraged tea-makers to hone their craft and introduce higher quality teas to the global market. In this presentation, Global Tea Ambassador, Elyse Petersen, will apply the concept of New World Teas, adopted from the wine world. Learn about the diverse potential of these teas. While blended teas have become increasingly popular in recent years, it’s essential to understand the exact differentiations between pure loose leaf varieties. In this workshop we will explore the flavor palettes, liquors, origins, and more characteristics of the six basic classifications of tea. By the end of the session, you’ll gain a deeper understanding of tea production and origin and be able to clearly differentiate all six genres of tea and their qualities. Plan to arrive early for the best selection. What is the Language of Tea? We will discuss professional tea terms and their meanings, learning how to discuss and appreciate teas the way tea professionals do. A short video of GS Haley Tea Buyer Aaron Vick (“The Language of Taste”) will be shown, and two audio interviews (“What Can We Learn from The Leaves?” and “Does Your Tea Have Good Rhythm?” ) of Brett Hinsch, author of The Ultimate Guide to Chinese Teas will be shared. We will then taste a couple of special teas, and, within small groups, discuss what we taste, practicing the use of the terms we just learned. Come taste and discuss what makes Yellow teas rare, ambiguous, and the least produced type of tea. Find out what tea is and what it's not. Where does tea come from from the origins of the Camellia Sinensis and where it comes from in today's market. What the difference is between the varieties of teas from black, green, and oolong to the herbal tisanes that are not tea at all. And what is so special about tea where we look at the scientific factors of tea and how it's make up contributes to it's wonderful benefits. Note; This tea tasting will be repeated in this tea tasting booth #2 at 11:30am - 12:00pm. Exploring Ceylon Tea provides an opportunity to learn about Sri Lankan black tea production, gain insights into how to best brew the tea and taste a variety of black teas from Sri Lanka. This session covers basic information of Japanese green tea - Sencha, Matcha, Genmaicha to name a few. After the session, attendees would know how Japanese green tea is different from others, how to brew it, and a few key points to steep it nicely. Tea festivals have been held over the centuries in various ways and different lands. 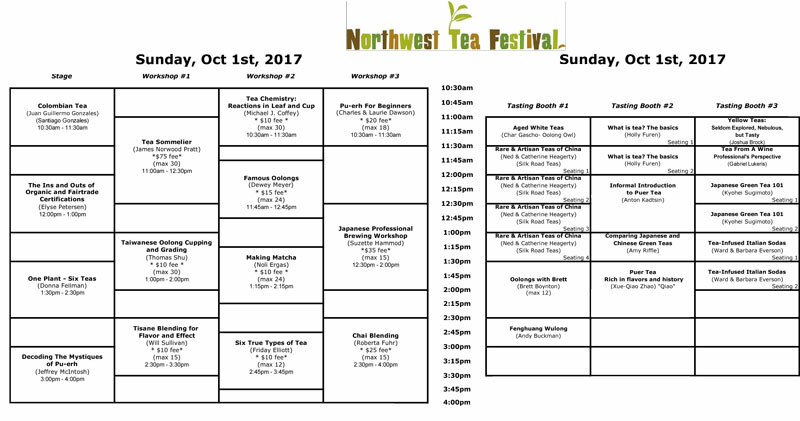 The Northwest Tea Festival first held ten years ago has helped to launch a nation-wide phenomenon. Tea festivals today are held coast to coast. Festivals modeled after our event are spreading the enjoyment of tea as never before. How come? How have they turned so many thousands on to the wonders and romance of this simple leaf? How have we? Silk Road Teas' session will introduce, discuss and taste rare, artisanal teas from China. These select teas are grown on small traditional farms, made each harvest season in very limited quantities & crafted to local customs in processing and taste profile. Presenting 3 varieties of "fresh" green, oolong and black teas, participants will have the opportunity to learn how high-grade artisanal teas are grown, skillfully crafted and processed creating some of the world's finest tasting teas. Each tea will be brewed using a traditional Chinese tea service of Gaiwan and small porcelain tasting cups. Grab your tea pot and come play with us! Everybody brews and everybody drinks tea! Or you are always welcome to just watch and drink tea. Wu-Wo tea ceremony allows many participants to brew and share tea together at the same time. No experience necessary. If you would like to participate as a brewer, please watch the below video on the basics of the Wu-Wo ceremony and what to bring. Hot water will be provided. Puer tea is gaining popularity in the U.S. but what is in it if you put away hype made by the "tea masters" and marketing by the merchants? Price versus flavor versus brand versus opportunity to feel special. Do you want to talk about it? One of the miracles and surprises of tea is that all of the diverse styles (green, black, oolong, white, etc.) come from the same leaf, and differ primarily in how they're processed. In this workshop, we'll follow the journey from plant to cup, learning how tea is grown, harvested, and processed to create the diversity we enjoy. You'll gain a deeper understanding of different tea traditions around the world, and be able to look into your cup and appreciate how it came to be. This session covers basic information of Japanese green tea - Sencha, Matcha, Genmaicha to name a few.After the session, attendees would know how Japanese green tea is different from others, how to brew it, and a few key points to steep it nicely. Brief history of tea which will include how tea began in China and spread to Europe and America, The Boston Tea Party, Anna Maria Stanhope (The Duchess of Bedford), Queen Victoria's role in taking tea, and more. Styles of tea service such as High Tea, Afternoon Tea, Low Tea, The "Elevenses" and more. Discussion as to the "proper tea time". Demonstrate enjoying an afternoon at a teahouse which would include making an entrance, introducing yourself and others, information on wearing gloves, how to handshake properly, how to take your seat at the table, and knowledge of where to place your purse, briefcase, eyeglasses and eyeglass case. Show the proper way to set a tea table and what to do once seated. Demonstrate napkin usage and placement. Demonstrate the proper way to enjoy eating scones and sipping tea. What's it like to be a professional tea taster? In this hands-on class, get up close and personal with a challenging variety of teas and origins, while learning professional standards for brewing, tasting and describing tea. You'll gain a deeper understanding behind the complexity of tea sourcing, and what a professional taster looks for at the cupping table in terms of quality. Always one of our most popular sessions at the NWTF, our cupping workshops sell out each year - so book early! Session includes a cupping set and tasting spoon for each attendee to take home to continue to practice their new cupping skills. All tickets for this workshop have sold out - Check at the festival location to see if any more have become available.. Experience the expansive world of Japanese teas and its intrinsic taste profiles and complexities. From the centuries old tradition to the modern use of trendy Matcha green teas, learn the proper preparations and why Japanese teas are gaining global recognition in the culinary world and its celebrated umami tastes. Participants will taste three different oolong teas from China and Taiwan. We will learn how oolong teas are produced and discuss different brewing methods. Introducing the different varieties of Puer - the proper ways to make the tea and to enjoy. Join me for a tea tasting journey around the world as we explore the exciting origins of tea as we know it today! Our journey will begin with the world's oldest known tea in China and stories of how it traveled on the ancient tea horse road. Our journey will continue to the shores of Europe when tea first arrived by ship in the 17th century only to be followed by the riveting tale of British spies heading to China to discover its mysterious secrets. The adventure will continue on American soils with stories of how tea was woven into the very historical fabric of the America's independence. Finally, we will touch upon how tea influenced the culture of British High Society. You'll conclude our adventure amazed by how much of our world history has been influenced by tea and how much it continues to influence our evolving culture today. Thank you to Miro Tea for donating some of the teas used in this workshop. Participants will sample a few different food items which have been infused with tea-flavors and will also be served the tea used in each food item. Methods of preparation and flavor infusion will also be explained. This ceremony is based on traditional Chinese Gong-Fu (literally “making tea with skill”) dating back over 400 years to the Ming Dynasty. 40 years ago Grand Master Tsai of the Lu-Yu Tea Culture Institute realized that Gong-Fu brewing was headed for extinction as Taiwan society modernized. In response, Master Tsai modified traditional Gong-Fu service to create a formal ceremony that was not only elegant and relaxed but also neat and practical. This demonstration will include an explanation of the basic procedure and equipment used in this skillful brewing method. The Tea Flavor Wheel is a sensory development tool to help you identify aromas and tastes, leading to an improved understanding and greater appreciation of tea. Much like the more familiar Wine Flavor Wheel, the goal is to use The Tea Flavor Wheel to help you hone your sensitivity to specific flavors, so you'll be able to discern and appreciate them more when you're not using the tool. A printed copy of The Tea Flavor Wheel will be provided to all workshop participants, to take home. This talk provides an overview of the University of California at Davis’s new Global Tea Initiative for the Study of Tea Culture and Science (GTI, https://globaltea.ucdavis.edu/). It describes its mission and goals, and explains the steps already taken on the path to becoming the Global Tea Institute. A Q&A follows the talk. Questions and suggestions are welcome. I was perfectly prepared for a life in tea because I had previously written a book about wine. Wine and tea are both agricultural products which at their best become works of art yet may be enjoyed even at their humblest. To come into existence, both of them require the hand of man, his understanding and skill, to join with the hand of God, His plant, weather and terroir. The only reason to produce either is that we humans like the way they make us feel: Felicitous Phenomena! For tea and coffee leave us much more serious". Of all the most revered foods and drinks around the world, tea and chocolate rank among the very top. They also pair extraordinarily well together. In this hands-on tasting workshop, you will learn about the different types of chocolate and cacao levels and gain experience in pairing them with some of the world's finest teas. You will learn to decipher flavor notes of both tea and chocolate to effectively learn how to pair them to further enhance the tasting experience. Various tea types such as green, white, oolong, black, and pu-ehr will be explored and savored in surprising, unique ways. Thank you to Miro Tea and Theo Chocolates for donating teas and chocolates used in this workshop. Herbs and spices are used in many tea and tisane blends. In this class we will focus on how to effectively blend with aromatic herbs and spices. We will discuss which herbs are good ingredients for blending and how to evaluate herb for quality. Then we will do a focused comparative cupping for a better understanding of flavor profiles of single herbs. Not all white tea is delicate and floral. White tea is also known as "Year one a tea, year three a medicine, and year seven a treasure." In this focused tasting session, we will explore a couple different aged white teas to taste what times does to white tea. All tea is processed immediately after being harvested, so t if you want to learn the art of tea making, you need to travel to origin. However planning an international trip can be daunting - visas, immunizations, foreign languages and beyond can intimate us all. And yet the joy of travel cannot be missed! In this session, we'll cover the basics of organizing a 2-3 week tea trip to India and Nepal. Come thirsty, because tea will be served! Why are Oolong teas baked? Join Tea Master Thomas Shu and learn why and how baking enhances the tea’s flavor. Coffee Roasters know how to create their signature coffees by baking or roasting. Oolong Baking Masters also bake their fine Oolong teas to bring out more layers of flavor. Only Oolong tea is baked in this way and the specific technique is very critical, even those lightly oxidized Pouchong or Jade Oolong teas require baking to stabilize their finish. Note - Nowadays, many farmers rush to sell their Oolongs to consumers without properly baking before packing. While you as a consumer do not have access to professional temperature controlled baking units, Thomas will explain how by using a simple sauce pan on your stove, you can enhance the flavors of your Oolong teas at home. Baking your own tea to create Vintage Oolong (Aged Oolong) is a new fashion in this old tea business. Dive into the world of Pu-erh tea, an often-misunderstood variety of dark tea exclusively grown in Yunnan Province, China. Pu-erh expert Jeffrey McIntosh will help you uncover what makes Pu-erh seem so mystical, including differentiating between raw and ripe variations, properly brewing and storing pu-erh, exploring tea fermentation, possible health benefits, and tasting notes unique to both ripe and raw pu-erh teas. Savor some decadent pu-erh teas and walk away feeling confident in your newfound knowledge. This is a fun and unusual twist on tea and food pairing. Dates pair fabulously with tea—all types of tea—and for many they make the perfect vegan and/or gluten-free accompaniment. There are many different varieties of dates and in this workshop we’ll taste four of them paired with each of four different teas. We’ll also try one with chocolate and for those who choose to participate, we’ll add some blue cheese. As in all my classes, this will be about discovering your personal preference in pairing teas with foods. We'll be using some unusual teas so discovering more dimension with white, green, oolong, and black teas is always a plus. The chemistry involved in making a cup of tea is fascinating. From environmental impacts on the amount of caffeine in a fresh leaf, to the more than 600 compounds that can be found in the smell of a cup of freshly brewed tea, there's a lot going on! This workshop will give you an overview of the major compounds and reactions that give different teas their characteristic colors, aromas, and flavors. You'll also learn how the chemistry of the fresh leaf determines whether it will make a better green or black tea, and why drinking tea for health may very well decrease your enjoyment of it. In this session we will share the origins, nuances and the sustainable agricultural story of Bitaco, Colombia’s first and only tea plantation focused on production of orthodox, organic fine teas. Come learn about this vibrant tea center high in the Colombian Andes; a colorful story involving decades of persistence, respect for local wild-life and a commitment to sustainable development. The pu-erh family of tea is broad and complex, frequently intimidating for those new to aged teas. This workshop will be a practical tasting session on the basics of pu-erh, including how to tell raw sheng pu-erh from ripened shou pu-erh, how to tell young from aged pu-erh, and guidance on buying and aging your own pu-erh. A take-home sampler will be provided to start one's own pu-erh collection. All tickets for this workshop have been sold. Check at the festival location to see if more have become available. 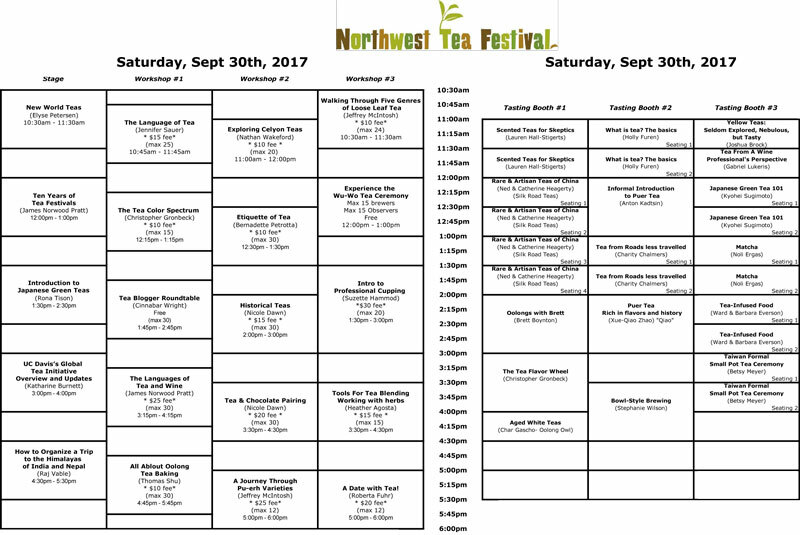 Join James Norwood Pratt, America's Tea Sage, as he instructs both beginners and experienced tea lovers in the ways of the leaf. Mr. Pratt will present a clear and concise overview of the six families of tea, their various national and regional origins, different characteristics and methods of manufacture, including insights into tea botany, history, the world-wide tea business, best ways to prepare teas and other matters. Intended for beginners as well as hardened and shameless tea lovers. At the end of the course, participants will receive an illustrated syllabus and a signed Certification of Completion. Experience four famous tea from China and Taiwan. Oolongs are highly revered, and the most intricate and complex teas to manufacture. This class of tea is partially oxidized and offers a wide range of styles, aromas, and flavors. Taste the light, creamy, floral essence of Taiwan's high mountain Alishan teas, to the dark, earthy roast of China's highly prized Da Hong Pao. Understand the manufacturing process, oxidation levels, and the legends behind these famous teas. The brilliant emerald of Japanese greens are some of the most alluring teas to savor…and challenging to prepare. In this hands-on brewing workshop,we’ll explore the breadth of Japan’s green teas - including numerous variations of sencha - to better understand how to instinctively prepare the cup that speaks to you. Through comparative tasting exercises, you'll learn: experience of Japanese professional cupping standard, teapot selection, water temperature selection, dosing the tea correctly, Japanese “flash iced” tea and cold brew techniques. Some core knowledge of Japanese tea is helpful for this Intermediate level workshop. Come prepared to drink a LOT of beautiful green tea! Session includes a Tokoname-yaki Japanese teapot for each attendee to take home to continue to practice their new Japanese Green tea brewing skills. Take your knowledge of Taiwanese Oolongs to the next level! Understand the basics of Taiwan Oolongs. Learn how they are classified by process - oxidation levels, rolling skill, and baking techniques. Learn how to professionally cup and grade each classification and to develop a Harmony Code for each tea. This Harmony Code details the ideal quanity of tea, steeping time and water temperature and will allow you to make tea and serve it with the best aroma, flavor and taste. Participants will sample syrups infused with the flavors of different teas, and will then be served an Italian Soda with a tea-syrup of their choice. Preparation of syrups will also be explained. Come learn how to prepare matcha for drinking in three different ways (the traditional way, a simplified hot preparation, and a cold preparation), along with ideas for plenty of other applications. We will also explore the differences between culinary and ceremonial grades of matcha. Attendees will get hands-on experience using both traditional and modern tools for matcha preparation, and everyone will go home with matcha samples. No matter what type of tea you enjoy – green, yellow, white, oolong, black or dark – it was made from the leaves of the Camellia sinensis plant. Join us as we delve into the six stages of processing that transform the living tea leaf into 6 different types of tea and identify the stage of processing that defines each type of tea and why. We will cover the basics of blending Herbal Tisanes for flavor and effect. Included will be a short discussion of the age-old practice of using herbs for health and pleasure, and together we will learn about synergistic effects of different herbs, primary and supportive herbs, and herbal harmony. Participants will have the opportunity to create their own Therapeutic Herbal blend to take home and enjoy. Chai means tea! In the west we often refer to chai as “chai tea” when what we probably mean is masala chai, a blend a black tea and spices. Chai traditionally was made with black tea, but in this class you will have the option of using either Rooibos, green tea, or black teas for a base. We taste all the base teas, and once you choose your preference you will be able to blend a medley of your favorite spices with your chosen base. We’ll blend, taste, refine and taste again if time permits. You can make it as spicy or mellow as you desire and it’s fun to taste each other’s creations. This is an interactive workshop of creativity and taste--and best of all you will take your custom blended tea home with you. Plan to arrive early for the best selection.. This tasting will explore the world of Fenghuang Wulong Cha focusing on the Jin Shan and Wudong Shan regions. It will involve comparative tastings of such Fenghuang teas as Da Bai Ye and Da Wu Ye Wulong. Explore the six basic types of tea - White, Yellow and Green, Oolong, Black and Post Fermented. Experience their tastes, learn how they are produced. Best brewing techniques for each type will be discussed as well as how to select the best tea for your enjoyment. Pu-erh tea is learned through experience and patience. Grown all over Yunnan on a dozen different mountains on thousands of farms, processed in hundreds of different ways, and stored in various conditions anywhere in the world, pu-erh presents an array of tastes and aromas in each cup. Chinese tea masters may dedicate a lifetime to cultivating a perfect tea cake.